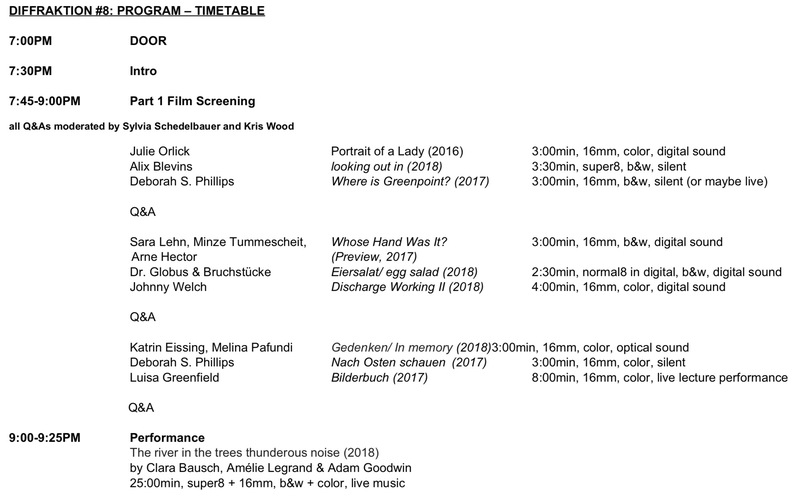 Following the success of the international symposium on the current situation of analogue film culture “Film in the Present Tense”, LaborBerlin eV is proud to present the eighth edition DIFFRAKTION. On Saturday, February 10, 2018, new works (including premieres!) Of the Labor Berlin members will be shown. This year, cross-border productions as film installations, live cinema performances and film screenings will be highlighted with the moderation of Sylvia Schedelbauer (former lab member) and Kris Wood (co-programmer at Wolf Kino). 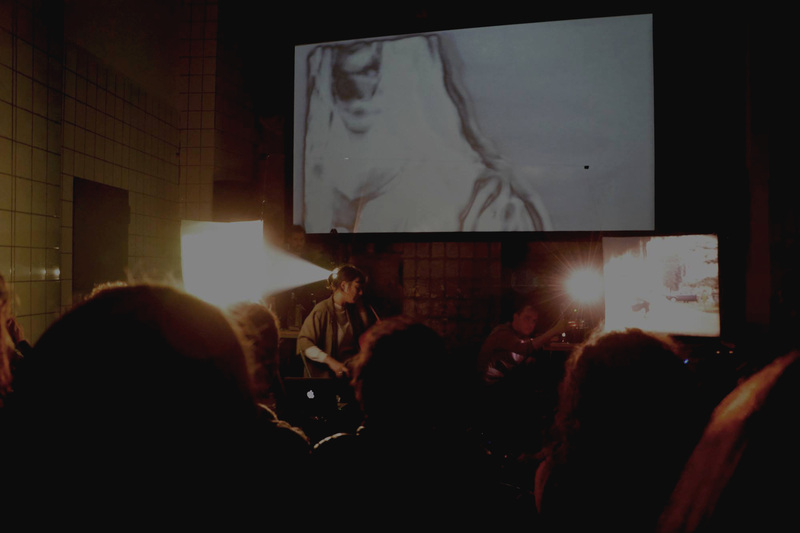 The works are projected under various formats, such as super 8, 16mm, slide film and digital. Mit Arbeiten von Michel Balagué, Clara Bausch, Alix Blevins, Igor and Ivan Buharov, Lazarus Dance, Distruktur, Dr. Globus & Bruchstücke, Katrin Eissing, Laurence Favre, Adam Goodwin, Luisa Greenfield, Arne Hector, Tiebault Imm, Tomasz Konart, Amélie Legrand, Sara Lehn, Julie Orlick, Melina Pafundi, Deborah S Phillips, Jan Rehwinkel, Björn Speidel, Giorgos Stavridis, Minze Tummescheit, Sophie Watzlawick, Johnny Welch. Eintritt: 7€ – 10€, Wir freuen uns auf dein Kommen! After the success of the international symposium on current development in analogue film culture: “Film in the Present Tense”; LaborBerlin e.V. is proud to present the eighth edition of DIFFRAKTION, the annual showcase highlighting new works (including premiers!) by LaborBerlin members on Saturday, 10 February 2018.
film installations and live cinema performances alongside a screening of films moderated by Sylvia Schedelbauer (former LaborBerlin member) and Kris Wood (co-programmer at Wolf Kino). Works will be projected on diverse formats such as super 8, 16mm, slide film and digital. With works by Michel Balagué, Clara Bausch, Alix Blevins, Igor and Ivan Buharov, Lazarus Dance, Distruktur, Dr. Globus & Bruchstücke, Katrin Eissing, Laurence Favre, Adam Goodwin, Luisa Greenfield, Arne Hector, Tiebault Imm, Tomasz Konart, Amélie Legrand, Sara Lehn, Julie Orlick, Melina Pafundi, Deborah S Phillips, Jan Rehwinkel, Björn Speidel, Giorgos Stavridis, Minze Tummescheit, Sophie Watzlawick, Johnny Welch. Admission: 7€ – 10€, we are looking forward to see you! There are several reasons for pulling strips of film from a storage box. An important one is to attempt to bring back the sounds produced while the images were taken. Technically the movie is silent, but that is not the whole truth. searching through fragments of darkness & light, siſting through discontinuous moments in a contained space. shot and edited on hand processed super8. Based on Material by Nikolaus Tscheschner ́s film: KALMENHOFKINDER-MURDERED AND FORGOTTEN that we discovered in laborBerlin. During our work on these remaining pieces, we felt the needs to commemorate the children in the children’s specialist departments Nazi Germany once again. This work is an attempt. basierend auf Material von Nikolaus Tscheschners Film: KALMENHOFKINDER-ERMORDET UND VERGESSEN die wir im Labor Berlin entdeckten. Während unserer Arbeit an diesen Reststücken entwickelte sich das Bedürfnis der Kinder in den Kinderfachabteilungen Nazideutschlands noch einmal zu gedenken. Diese Arbeit ist ein Versuch. Der Sturm erhebt sich. Auf einem Boot mit gehissten Segeln, weit draussen, vermischen sich die Litaneien der Passagiere mit den Flüchen der Matrosen. Das Meer erbricht sich über sie, und sie erbrechen sich über das Meer. Ode an die Prekarität in einer barbarischen Welt, Sans Lune (Ohne Mond) ist auch eine Metapher für das Menschsein in seinem Kampf ums Überleben. Exu and Ogum stand for the principle of movement and the symbolism of the path: they allow a movement to begin, they clear the path and break obstacles. Exu und Ogum stehen für das Prinzip der Bewegung und den Symbolismus des Weges: sie erlauben es einer Bewegung, zu beginnen, sie machen den Weg frei und durchbrechen Hindernisse. I. Darkness: Flesh hate breeding half slaves. Division. Hell adores infinite fools. A. Blood: Dissolve fear beyond Eyes. Harmony. New Priest kills the Old. O. Sun: Drinking Fire of Fire. Undulations. Burning in Splendrous Desire. filmed over the course of two years. memories of pancake love and hot summer days, a lady encapsulates floral lush. A detached human hand found aſter a bomb attack takes us into the abyss of the German intelligence apparatus. Nach einem Bombenattentat führt eine herrenlose Hand in die Abgründe von Politik und Verfassungsschutz. Reflections on the joy of being able to use a large studio to paint & to be able to film as well for a short time. Filmed in Kunstquartier Bethanien, Berlin-Kreuzberg. Der Film ist enstanden im Kunstquartiert Bethanien während, mit grosse freude, ein grosse Atelier zum malen benutzen konnte. This sci-fi unmasks nobody, it doesn’t make history, stimulate consumption or serve anybody’s interests. An audio-visual discussion about the vomiters culture in the reflextion of today ́s Germany. Eine audiovisuelle Auseinandersetzung mit der Erbrecher-Kultur im Spiegel des heutigen Deutschlands. “the river in the trees thunderous noise” (2018) will take place around the stage of the “curved screen”. A rhythm of focus, light, shadow, noise and music brings the projected scenes into the space of CRLCR. Observations of everyday life create the imagined fictional space – the associative in the consideration. CB examines, documents, stages the unusual perspectives of these private moments in a multiple projection of two S8 and three 16mm projectors. Under the guise of a naturalistic simplicity AD and AL develop a complex landscape using cello, double bass, voice and electronics, using the poem “Commencement et fin” from Jean Tardieu. 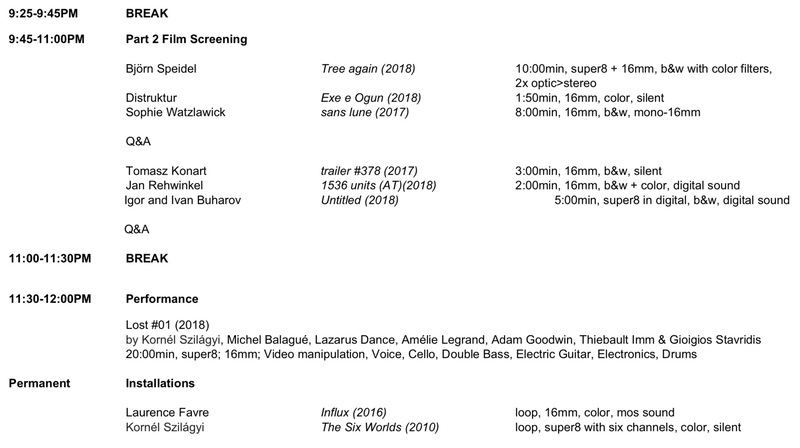 Paying special attention to the environmental soundscape as well as the sound of their own instruments, they impose an intimate presence, playing in between expression and imperceptible sounds, asking about presence and absence, giving time for the film to express itself. They search without finding, trying and failing. During the performance with Clara they combine words and poetry with string sound experiments to produce an emotional disorder. The performance captures a vacuum of the unforeseen, to arise in the context of the improvised life montage. 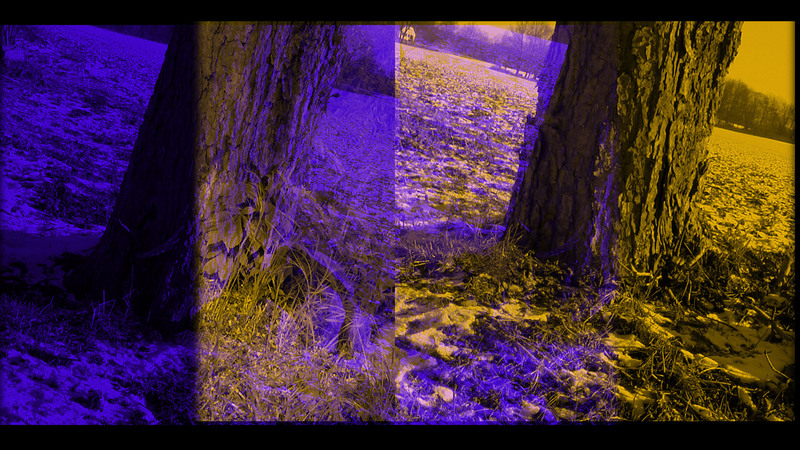 A dialogue between image and music in a search for new ways of seeing. A time travel to make visible what is invisible. Amélie Legrand is a French cellist and composer currently based in Berlin, Germany. She is active within many different musical scenes, including noise rock, Arabic music, free improvisation and film score composition. She is dedicated to exploring the cello to its fullest potential and collaborating with various performers and artists. Adam Goodwin is a Texan double bassist, composer, and visual artist. Having completed music degrees in both classical and contemporary double bass performance, Goodwin moved to Berlin, Germany to delve fully into the world of experimental and improvised music. He is also active within the Turkish and Arabic music scene in Berlin. Goodwin’s musical approach places a heavy emphasis on physical gesture and spontaneity, along with a conscious consideration of the particular space and context in which the music is taking place. Clara Bausch is an artist and filmmaker. She graduated at the University of Fine Arts, Berlin and is a co-founder of LaborBerlin. A detailed observation and intimacy of a private space is the starting point in her films, photographs and drawings. The focus of her work is on processes that are in transition.They are signs of everyday acts that she documents and places as possible linking points for dialogues. Lost #01 is a multidisciplinary performance with analogue film projections, analogue music, video manipulation and electronics. Heated by the sun, a frozen stream slowly wakes up and air bubbles start moving under a thin ice coat. Film gives, this in reality ephemeral moment, a never ending repetition at the rhythm of a heart-beat.